Given the engine ran after the failure, it is unlikely any valves bent. It is critical not to run it again even to " get it on the tow truck ". If it goes to a shop, disable the starter / battery and put a note on the steering wheel not to run the engine. Damage should be limited to timing components at this point and it is worth fixing. If the engine is run again to " test ", it may become severely damaged. Given you know the engines history, there is absolutely no reason to run the engine prior to repairs. Maybe it wasn’t the lifters you were hearing? Was just thinking about that.....likely was the tensioner or the chain tapping. No, I know what timing chain slap sounds like. When the tapping first started, I removed the engine covers and narrowed it down to the 3rd or 4th valve on the left side of the engine. It was a very distinctive tap like the older diesels would make when the valve lash was too great and needed adjustment. I will take the advice of 97 and disconnect the battery so that the shop doesn't try to drive it into a bay. When the cover broke I had no idea what happened, my red battery light came on from the oil pouring directly on the alternator pulley. I was in traffic and drove it about 2 blocks until I found a parking lot to pull into. I immediately shut is off once in a parking space. This is why, and I could be wrong, that I think that the valves didn't get bent. At least I pray that they didn't. About a 1/2 a mile before this all happened, the car started stalling so I restarted it and it ran fine, it was only when I started to smell smoke from the oil pouring out of the upper chain cover that I pulled over. My 2005 E320 CDI timing chain has just broken and blew out the top of the upper timing chain cover. ... the car runs with no smoke but I don’t want to run it. Let me get this straight. The chain "broke and blew out the top of the valve cover"... but the engine will still run?!! If so - the chain isn't "broken", but you clearly have some other issues going on. While not likely related to this failure, oil quality and change interval can absolutely cause increased wear on internal moving parts, including the timing chain. Using non-diesel rated oil, or changing at extreme intervals (20k-30k), or worse yet both of the above... that'll hurt expensive things. Look back through the "extensive service records" and see what oil changes are documented. It was probably done on schedule with the proper lube but you never know. 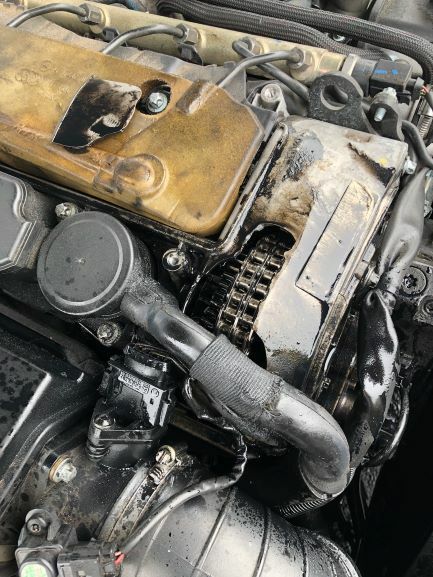 While not likely related to this failure, oil quality and change interval can absolutely cause increased wear on internal moving parts, including the timing chain. Everything will wear more but engine bearings will suffer before the timing chain will. Roller chains are pretty tolerant to poor lube. I will give that a Morse " silent chain " used on 60's + American engines will wear with extended oil changes. Using non-diesel rated oil, or changing at extreme intervals (20k-30k), or worse yet both of the above... that'll hurt expensive things. At those intervals, the engine would have a slight rod knock , worn pistons / rings with the resultant blow by. As mentioned above, right now we don't even know what exactly failed, since the timing chain is still intact. The only item confirmed to be damaged is the valve cover. Video showing what's under the cover, and in the comments the owner posted that that the root cause was the tensioner (yes, I know, different problem, but he has 420kmi and reported the chain was "barely stretched"). I wouldn't be surprised if the failure on BDB's car is somehow related to the tensioner. This may have been the case in my failure, allow me to more clearly state what happened. I was driving the car, it performed as it normally does and suddenly it just shut off. This has never happened before. I assumed it was a fluke and restarted it and the car ran fine. Within a mile or so the red battery failure light came up on my display and I could see and smell smoke so the assumption was that my serpentine belt must have broken. Car kept running and I was in heavy traffic so thinking that it was just the belt I continued to drive it about 2 blocks so that I could pull into a parking lot and be safely away from the traffic. It was during this short drive that I began to think it was something worse because the smoke and odors were so pervasive. I looked in my side mirror to see if the exhaust was smoking but there was no sign of exhaust smoke. I immediately shut the engine off and popped the hood open and I saw engine oil pouring out from the upper left side of the engine. I removed the engine covers and was shocked to see pieces of the upper timing chain section of the valve cover missing and the double geared sprocket exposed. The chain appeared to have jumped forward in the sense that instead of sitting on both gears of the upper double gear, the part of the chain that would sit on the rear gear was now on the front gear and the part of the front chain that normally sat on the front gear was off. Almost like how your chain would jump the sprocket on your bike when you were a kid but in this case, as it is a double roller, the rear chain jumped to the front sprocket. The chain is intact and not broken. I pray that no vales were bent because the cost of replacing the engine would exceed what I paid for this vehicle. I will take a picture and post it here shortly, thank you all for the overwhelming responses. Bent valves don't = replace the engine unless engines are super cheap. Fixing bent valves consists of removing the cylinder head and sending it to a machine shop for valve replacement / regrind. In some cases, the lower portion of the valve guide will break but they are replaceable and, given the small diameter of your valve stems, guide breakage isn't likely. Is it worth fixing? You really need to take apart the Engine and see what was or was not damaged. If you are paying someone to do that then that gets too expensive. If you cannot do the work on the Engine then the cheapest rout is often a used Engine. What was happening when the timing chain derailed; idling, on the Freeway or in town driving? If it was idling then there is that chance of only bent valves. If you look closely the chain somehow jumped forward by one gear..... I don't know how that might be possible but there it is...... what are the chances that it did in fact jump time and is there a way that I can tell if any vales are bent without removing the cylinder head???...... In it's current state, that is? The only way to tell is to pull the cover and line up all the marks. If it IS out of time, it can't be much, or it would not run. Either way, the cam cover has to come off to inspect. If you do have a loose pump shaft gear, you may have dodged a bullet by shutting it down before something actually broke. Thanks roll guy, I imagine that the timing marks are on the camshaft gear in the picture and the harmonic balancer? I am not really sure, but I assume the marks are not unlike an OM606. If so, the two cam gears have marks that need to line up, and I believe a mark on the chain gear will line up with some mark on the cam tower. If these three marks line up, the balancer should line up with the 0lT mark unless the crank is 180* out.